for a new school campus build under the British Government’s ‘building schools for future’ program. This project was highlighted as a model for UK public schools by Dell at BETT (London) in January 2008. After moving to Beijing with his family in the fall of 2008, Muhammad carried out an IT infrastructure overhaul at The British School of Beijing before its acquisition by the Nord Anglia Group. He then moved to one of Asia’s top tier international schools, the Western Academy of Beijing (WAB), renowned for its educational technology program and ‘China’s first ever’ 1:1 Apple laptop program from grade 2 to 12. After his first year as an IT consultant, Muhammad stayed at WAB for four more years as head of IT, assisting senior management in developing and extending technology integration within school programs. In November 2015 Muhammad began working with ORIGINS Education (Beijing), providing consultation on IT budgeting, infrastructure, design and integration for several new school projects geared towards implementing 21st century technology and educational pedagogies. Muhammad has not only been successful in reforming 1:1 programs from single brand/device to bring your own device (BYOD) programs, but has also led successful and model implementations of 1:2 (laptop and tablet) environments. He has steered several initiatives for integration of educational technologies in existing as well as development of new school programs covering everything from research, vendor selection, pilot trials, budgeting and staff training to working with all stakeholders to ensure that schools meet their targets with a high return on investment, and, more importantly, that they achieve marked improvements in both student learning and staff and parent involvement. 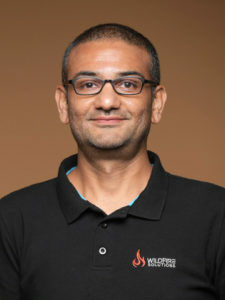 As Wildfire Solutions’ Co-Founder and Tech Lead, Muhammad is a staunch believer that school technology infrastructure should be ubiquitous, meticulously- planned, future ready and professionally maintained. Further, Muhammad believes that this infrastructure should be nearly invisible and yet provide a foundation upon which a versatile, strong and engaged learning environment can be built, thus nurturing the development of young learners on their innovative, intrinsically-motivated learning journeys. With school technology systems arranged in this way, Muhammad argues schools can support their own vision and strategic development plans, and allow for successful integration of technologies into the daily lives of both teachers and learners. Andrew is an experienced communications manager and creative team lead with experience at top-tier, established and growing schools alike. A licensed teacher from New Brunswick, Canada, Andrew’s background is in international education and multimedia communications. of two schools in China (Beanstalk International Bilingual School and APEX International School), and established the branding for Innova Academy as well as for the education management company ORIGINS Education. Andrew brings his strengths in branding and identity, website and graphic design to his projects, while regularly helping to bridge the divide between the business and education sides of school administration by virtue of his experience on both sides of the table. A proven creative specialist and web developer, Andrew works with both physical and digital assets and a systems integration mindset to leverage the capabilities and virtues of each, while carefully crafting the user experience across each organization’s environments. 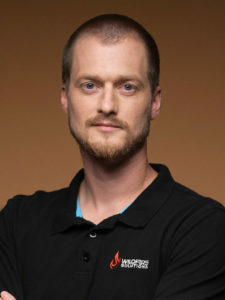 As Wildfire Solutions’ Co-Founder and Creative Lead, Andrew is a champion for organizations making authentic, creative connections within their communities. He believes that organizations prime themselves for growth through honest dialogue, focusing on strengths while working to resolve issues, and by extending their resource networks. Combining his experience in communications, public relations, marketing, design and teaching, Andrew strongly believes in creating meaningful, authentic connections within school communities and is an advocate for forward-friendly application of technology and pedagogy wherever possible. Through active connections between systems and environments (both physical and virtual), Andrew argues organizations can support their own development plans, present strong branding, and promote healthy and engaged communities. Wildfire Solutions exists to provide schools and SMEs with the edge they need in today's competitive environments. We bring our passion, skills and experience to the development and implementation of tailored tech infrastructure, EdTech and digital brand solutions. Wildfire brings ideas to life. We provide customized and scalable solutions based upon best practices in education, business, technology and communications. We build remarkable partnerships with our clients and achieve outstanding results. With an understanding of each client's background, vision and ideas for growth, Wildfire projects begin with clear requirements and objectives that set the stage for success. Working closely with our clients, we engage our considerable resources and wide reaching professional network to deliver solutions that get noticed.